An early start to this exciting day was called for by everyone in the group. I left Pringle bay at 04:30 and picked up folk along the way. We arrived at the Great White House at 06:00 to meet the Dyer Island Cruises team. 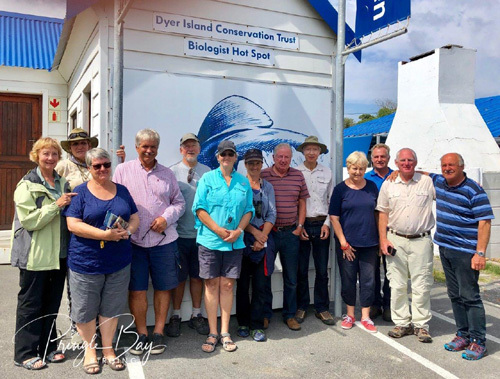 Not many of us had done a pelagic birding trip before, so Hennie Otto and Wilfred Chivell took time to explain and put us at ease over a cup of coffee. 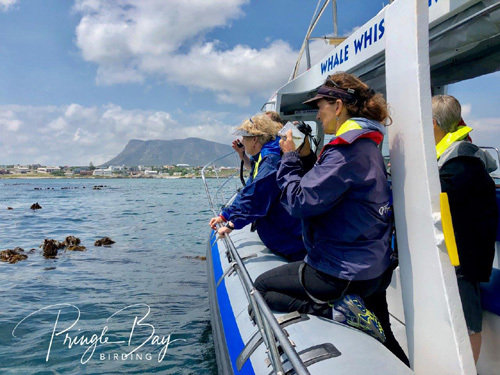 We then headed down to Kleinbaai harbour and boarded the magnificent “Whale Whisperer” and headed off into the big deep sea in a south-westerly direction. We crossed the shipping lane and lost sight of land around 40 km out. The weather was magnificent and the ocean calm. Our main rendezvous area was: 34 57.836’S 18 33.894 E – which is close to the edge of the continental shelf approximately 80 km off shore. 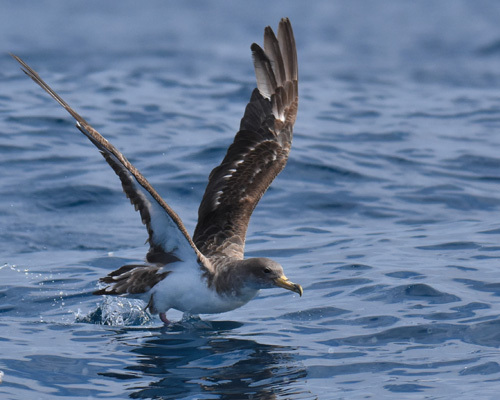 The ride out was long, the anticipation high and when we spotted our first real birds the crew indulged us by stopping and we saw our first Sooty and Cory’s shearwaters plus a single lonely Common Tern. We had a fly-over of Cape Cormorants and Cape Gannets, with the odd Kelp Gull. 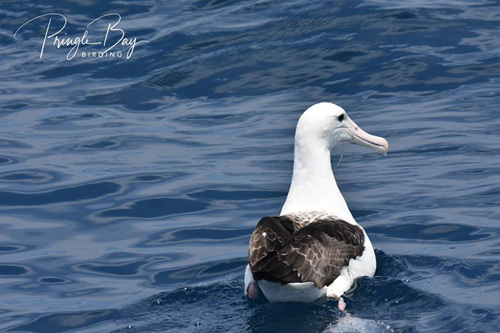 The first hint of an unusual sighting was the approach of a Parasitic Jaeger (also referred to as Arctic Skua), then our first glimpse of an albatross – a Shy Albatross obligingly allowed us to have a good look! All members of the crew were patient, as they knew we would see many more birds, but allowed us all the time in the world to check out what was fast becoming one “lifer” after another! At this stage, my frustration levels were high. My ability to photograph these birds was proving somewhat difficult! 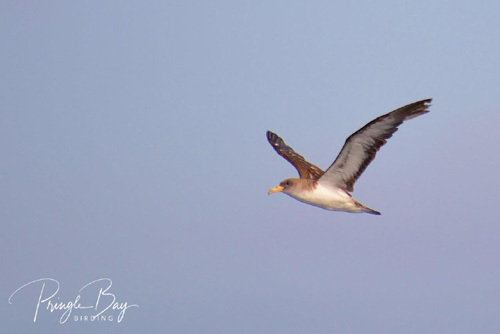 Brian did warn me – lots of sea, blurred birds or parts of birds will be captured. Little did I realize until I started editing!! So, I returned to my binoculars and first had a good look at the birds then tried to take photographs. 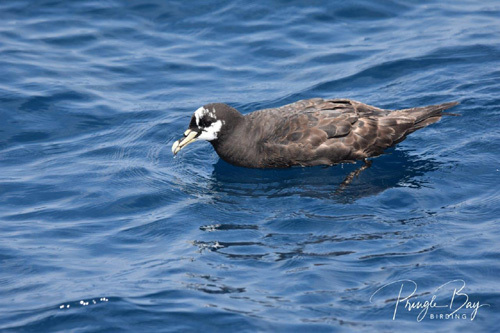 We saw White-chinned Petrels by the dozen and we initially thought we had a sighting of a Spectacled Petrel. 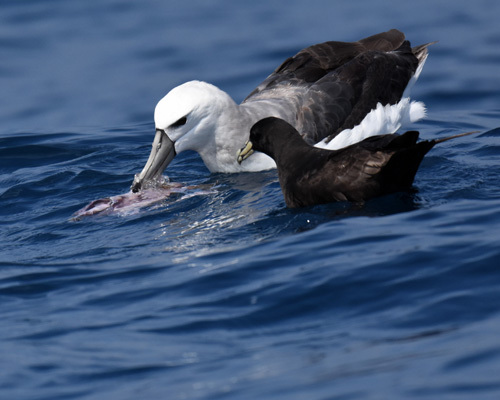 This was later shown to be a leucistic White-chinned Petrel. Next, we spotted the fishing trawlers and all in all there were 5, which boded well for a good day of birding. The frenzy behind these boats was a spectacle like none other. 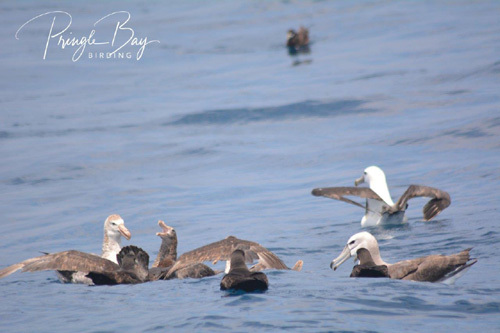 Thousands of birds flying, diving, sitting, eating – we couldn’t react quickly enough to shouts as different birds were spotted. To say I was overwhelmed doesn’t come close to describing how it felt and I know the whole group felt the same. 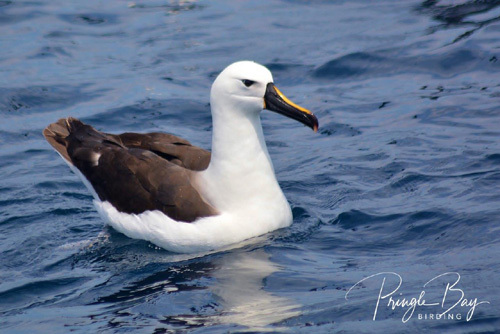 Four different Albatross’s were seen – Black-browed, Indian Yellow-nosed, Shy and the Northern Royal. 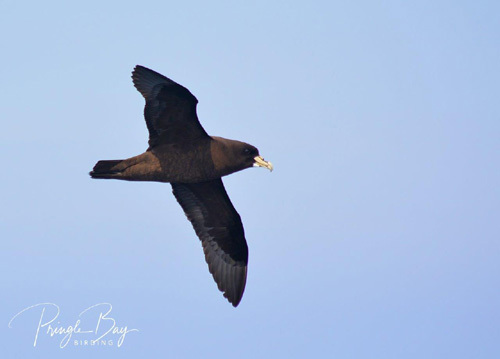 The latter was initially identified as a Wandering but after consulting with the experts it was decided that the black-cutting edge along the bill was definitive! 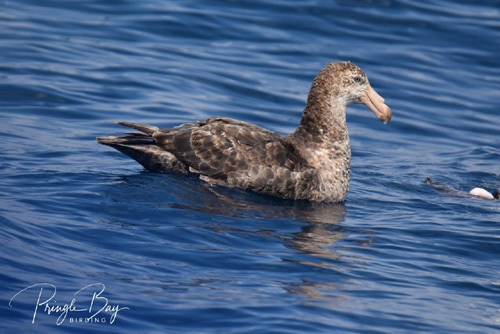 Four Petrels were identified – Northern and Southern Giant, and the smaller Pintado and White-chinned. Magnificent birds all and while the White-chinned were there in large numbers we only saw two Pintados – these are more common in winter months. 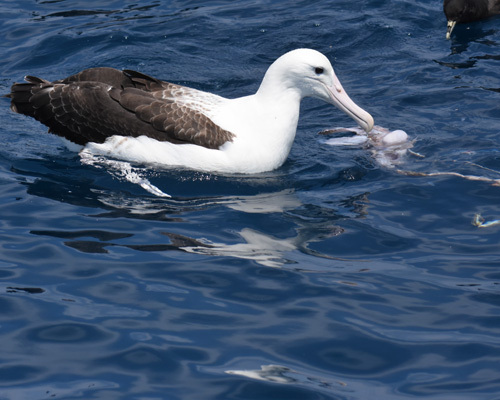 The Giant Petrels were almost the same size as the Albatross’s which was interesting to see. We saw Swift and Common Terns. Jill and I thought maybe Arctic Terns too, as we felt that tail streamers were different on these birds, but they were too quick in flight to confirm! 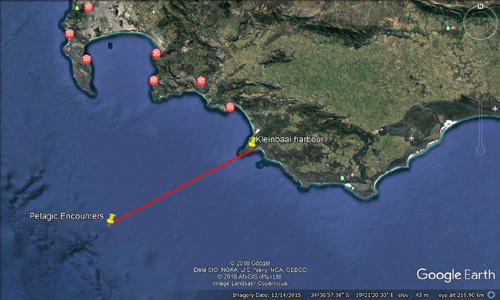 Three different Gulls were seen – Kelp, Hartlaub’s and Sabine’s. The latter are distinctive smaller gulls that were bobbing about on the water. The Hartlaub’s were seen in Kleinbaai Harbour. 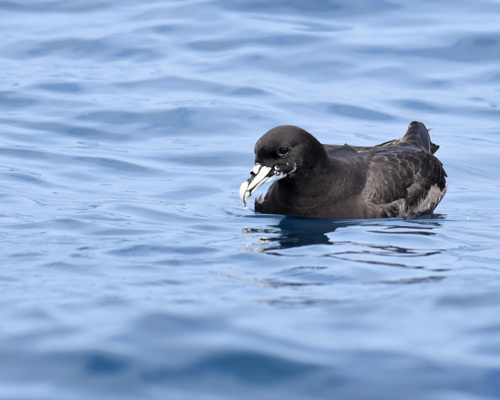 It was wonderful to watch the little European Storm Petrels, diving and generally whizzing around. Large numbers especially at the tail of the chum spill. Cleaning up the smaller bits of by-catch flotsam. Frustratingly difficult to photograph and hugely different in size when compared to all the other birds we saw. 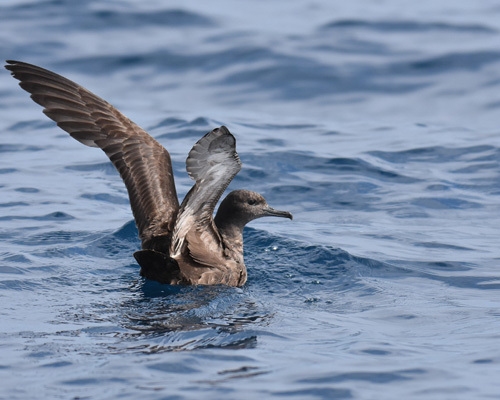 The Shearwater’s are handsome birds, we caught glimpses of four - Cory’s, Great, Manx and Sooty. The latter being the most common and easy to identify. The Cory’s were beautiful contrasts to the darker birds. Closer back inshore we saw the Bank, Cape, White-breasted and Crowned Cormorants coming into harbour. 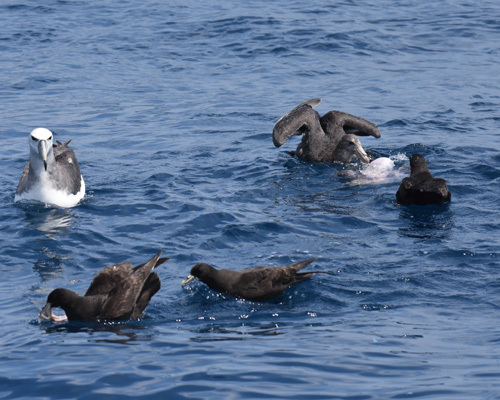 The squadrons of Cape Cormorants were beautiful to watch as they skimmed the sea’s surface, often in formation. Little did I know how closely most of the birds hugged the surface of the water. Luckily, we had no wind chop, so these sightings were made easier. 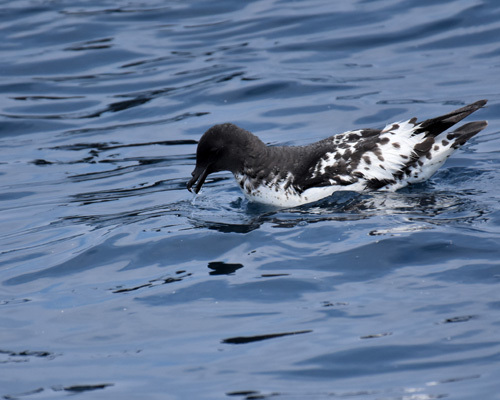 Jill Shapland-Smith: Fascinating to go out to sea and witness the fishing trawlers and birds in action. 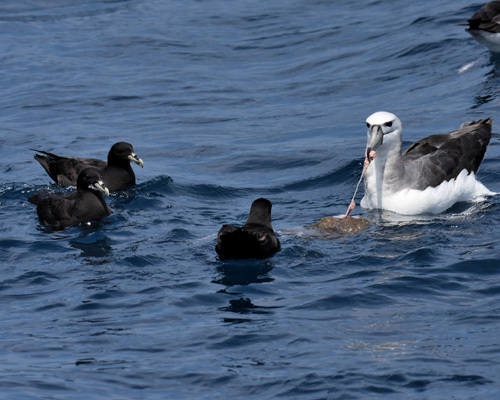 I was totally amazed at the quantity and quality of the Pelagic birds we were able to see. It was a reality check to see the waste (dead fish) left behind the trawlers. However, they do provide food for a lot of birds. 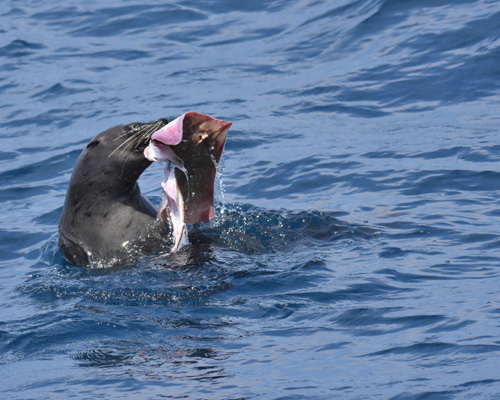 I had to wander what all the Pelagic birds would feed on if the trawlers weren't out there? Would they be able to catch enough live fish to sustain themselves? 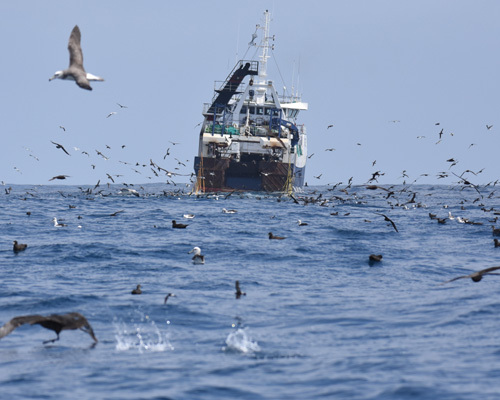 Are the trawlers more of a danger for the birds or do they help sustain their numbers? 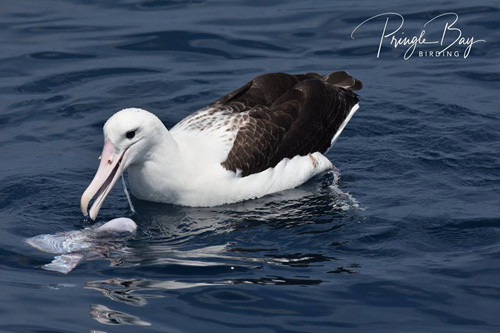 Emmie Ackermann: What an experience the Pelagic trip from Kleinbaai was. 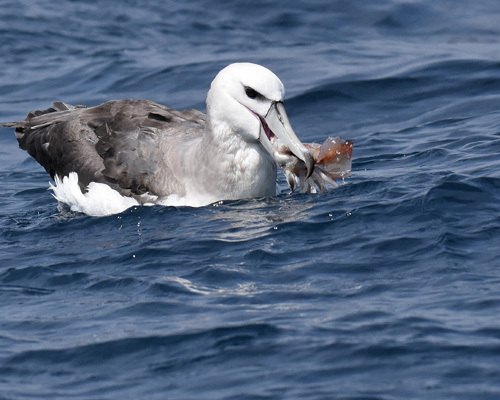 I was looking forward to this trip and imagined that it would be wonderful, but it exceeded all my expectations in every aspect ... the boat, the crew, the hospitality, the expertise, the companionship of fellow birders and on top of that the actual birding. It was an experience that I can highly recommend and that I would love to repeat. 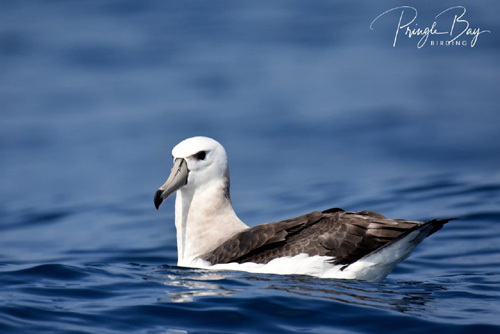 Tobie Louw: It was an exceptional birding experience. We were fortunate with great weather and sea conditions. On top of that we were guided by a top team from Marine Dynamics. They were all very experienced and helpful. I scored more lifers on Tuesday than during a full week recently in Northern Kruger! 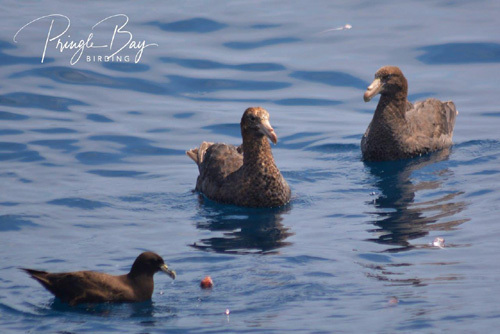 Brian Taylor:The pelagic organised by Anton exceeded my expectations, due, to a large extent the very professional way in which Wilfred, Hennie and the Marine Dynamics crew managed the trip and the individual needs of the passengers. 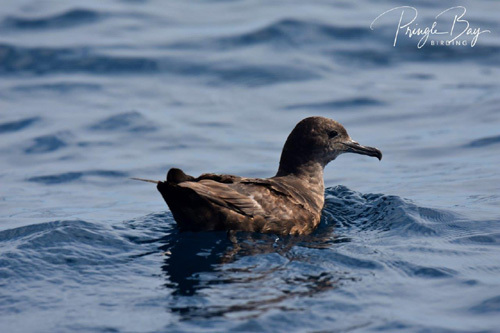 It is so rewarding being amongst people who handle the vessel so competently, while being so enthusiastic when identifying and photographing the various species of marine birds. 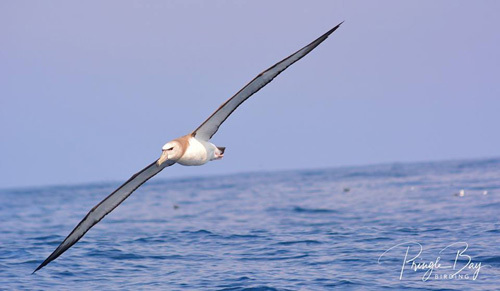 Their overall commitment to conservation makes them very special group of people and they deserve all the recognition and positive publicity we and BirdLife can offer. 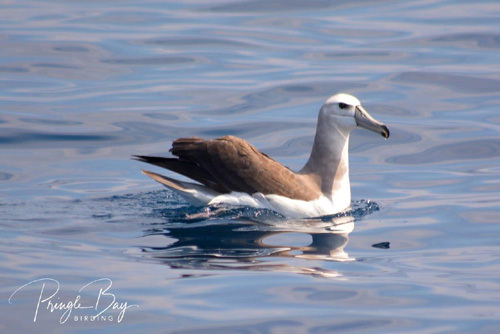 Thank you to Pelagic Encounters of Marine Dynamics and Anton of Birdlife Overberg for organising a truly special outing!